In support of the Tony's Kansas City Defense Fund and in an effort to ensure that local bloggers such as myself are free to call 'em as we see 'em, without fear of having our a$$es sued off by union bosses with lots of money and lawyers in their pockets, I will be donating all of the royalties for the month of September from the sale of the below book to the aforementioned legal fund. 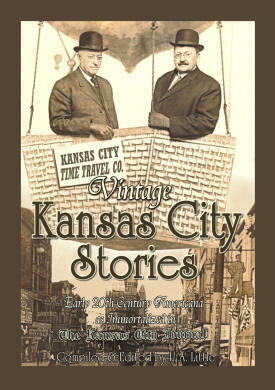 Here's your chance to own a book that Kansas City native Ed Asner said he loved (and called "a hoot") while helping out a local blogger who is always waaaay ahead of the humdrum local media in reporting stories that have extreme impact on the lives of citizens in our community (not to mention that he's always been extremely kind to yours truly). I call on you to help protect free speech in the local blogosphere. Donate to the fund, or get the book. You'll like it. It's funny. Side note: Speaking of Ed Asner, in the middle of September I will be auctioning off a unique Ed Asner collectible along with some other Vintage Kansas City treasures for the sake of the cause. Be ready to bid early and bid often! More details coming.